G-GRSZ system, Perrigen Falls. On the 11th of January at 3:04 EVE Standard Time, a battle unfolded in the system between local residents and the inhabitants of low security space. The battle was fought over a Sotiyo engineering complex, the largest of the industrial structures released in the game. Shadow Cartel [SHDWC] and Did he say Jump [JMP-N] scouted this particular structure anchoring in the system and formed a fleet in order to destroy it. A 120 pilot Proteus strategic cruiser fleet was assembled, and untilizing wormhole connections, traveled to the system. Upon arrival, the force found the structure deploying with no one to protect it. Taking advantage of the fact, the Proteus fleet set up on the engineering complex and waited for it to start going online. Once the structure exited its deployment stage and tried to become operational, the strategic cruisers opened fire and started chipping away at its health points. 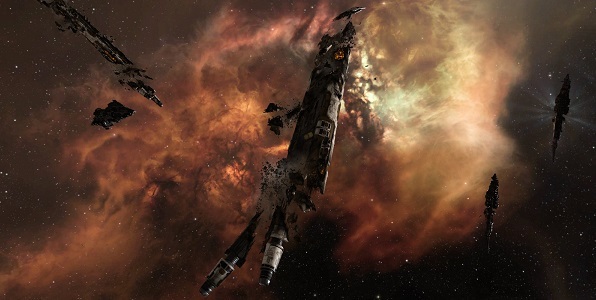 As the structure slowly withered under fire, the owners of the structure and their allies organized a defense force of Cerberus heavy assault cruisers, estimated at 50 pilots. The fleet rushed to the system, warping to the engineering complex and landing 100 kilometers away from the Proteus fleet. The strategic cruisers quickly took note, switched to long range ammunition and prepared to engage the new arrivals. The two fleets opened fire on each other, the heavy assault cruisers firing salvos of missiles as they burnt closer, settling finally on 70 kilometers range. The Proteus fleet had no trouble returning fire, beam laser batteries and railguns acquiring their targets and firing nearly in unison. With each volley, a Cerberus went down, the strategic cruisers’ firepower overwhelming their shields. As the fight started, a Pilgrim force recon cruisers uncloaked near the strategic cruisers and lit a cynosural beacon. The surprised attackers hastily switched targets, firing on the cruiser and dispatching it but not before it let in several carriers and dreadnoughts. One of the carriers quickly lit another cynosural beacon, letting the rest of the capital force in. By the end of the fight, the defenders would bring in more than 3 squadrons of capitals, mainly carriers but also force auxiliaries and dreadnoughts. Faced with such display of force, the attackers did not waver and started to spread tackle across the capital group. The carriers launched fighter squadrons while the dreadnoughts entered their siege cycles and opened fire on the strategic cruisers. The fight turned chaotic as the defenders spread across the field, the capitals aligning off while the sub capital force attempted to remain in range of the newly arrived force auxiliaries. For the attackers, their fleet remained anchored up, only interdictors and interceptors breaking off to keep the host of capitals pinned on the grid. Even with the capital group, the defenders were unable to repel the attackers. The strategic cruisers continued to burn through the hostile sub capital force, even as more and more ships were brought in to replace losses. The attackers kept switching targets, going from mainline ships to support ships to finally fighters. As the mass of carriers on the grid increased, the fighter squadrons became a real threat. The spread fire also put a strain on the logistics wing, resulting in several strategic cruisers destroyed as the battle raged on. Though continuing to suffer the odd loss, the strategic cruiser fleet managed to tank the incoming damage. As it thinned the number of hostile sub capitals and fighters, it was able to weather the firestorm, never letting up in its attack. Force auxiliaries and dreadnoughts were the first of the capital targets to feel its wrath. One by one the giant ships were overcome, exploding in bright flashes. Nearly 30 minutes in, and the field around the engineering complex was filled with wrecks. The Proteus fleet was holding its own while the defenders kept reinforcing their fleets, throwing everything they had against the attackers. Slowly, the heavy assault cruisers gave way to Ferox battlecruisers who themselves were easily dispatched. In desperation, the defenders started throwing in tactical destroyers, all the while more and more capitals jumped in and joined the fray. The attackers had enough. With the vast majority of capitals tackled and the defenders’ fleet broken, the Proteus fleet decided to turn its fire on the engineering complex. The structure, already damaged from the start of the fight, could do nothing to resist the onslaught and went up in flames. The Sotiyo was rocked by innumerable explosions before finally rupturing in a great ball of fire, signaling its demise. With the engineering complex destroyed, the defenders had no alternative but to extract. However, a host of capital ships were by then tackled across the field, held by the Proteus fleet. The defenders focused on freeing them, targeting the tackle wing of the Proteus fleet while the capitals themselves tried to burn away in opposite directions. The strategic cruisers started the slow process of breaking the capital ships while clearing sub capitals which continued to warp into the fight in a piecemeal fashion. The strategic cruisers descended on the capitals, eliminating them one after the other like a plague of locusts. The fleet focused its fire on the carriers furthest away from the remaining force auxiliaries, destroying carrier after carrier with impunity. Fighters were mostly ignored, the defenders’ firepower having lessened to such great extent that the Proteus fleet was able to tank the remaining fighter swarm. Several capitals did manage to escape the slaughter, either being too far from the strategic cruisers to be tackled or their allies managing to clear the tackle off them. These ships warped off or executed emergency jumps out of the system. Yet these were few and far between. Every minute saw another capital ship destroyed, the relentless bombardment of the strategic cruisers overwhelming shields and breaking through thick armor. The last capital ship destroyed, a Minokawa force auxiliary, fell an hour after the start of the fight. By then, the field had become a graveyard, countless capital wrecks littering it as well as the remains of their support fleet not to mention the engineering complex. The defenders managed to extract what they could and retreated, leaving the Proteus fleet in command of the field. With the grid secured, the attackers looted what they could, destroying the host of fighters which lay abandoned among the wrecks. With both the objective and the battle won, the Proteus fleet made its long journey home, bringing an end to the fight. Battle report for the G-GRSZ system can be found here. All told the battle lasted 65 minutes with Time Dilation not reported and the system hosting an estimated 220 pilots at the peak of the fighting. Shadow Cartel and Did he say Jump lost 16 ships in the fight, 7 of which were strategic cruisers for a total of 4.99 billion ISK damage. The defenders lost 209 ships in the fight, including but not limited to 3 dreadnoughts, 4 force auxiliaries, 15 carriers and 23 heavy assault cruisers. 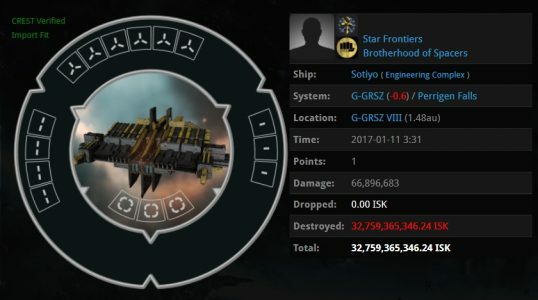 Along with the Sotiyo the damage done reaches 111.27 billion ISK. Rattling nice style and great subject material, nothing else we require : D.
of course like your web site however you have to test the spelling on several of your posts. Several of them are rife with spelling problems and I find it very troublesome to inform the reality on the other hand I?¦ll certainly come back again. You actually make it appear really easy along with your presentation however I to find this topic to be actually something which I feel I would by no means understand. It seems too complicated and very broad for me. I am having a look forward in your next post, I?¦ll try to get the hang of it! Great V I should certainly pronounce, impressed with your site. I had no trouble navigating through all the tabs as well as related information ended up being truly simple to do to access. I recently found what I hoped for before you know it in the least. Reasonably unusual. Is likely to appreciate it for those who add forums or something, web site theme . a tones way for your client to communicate. Nice task..
You really make it appear so easy with your presentation but I to find this matter to be really something that I believe I’d never understand. It seems too complex and very huge for me. I’m looking forward in your next put up, I will try to get the dangle of it! Some truly nice and useful information on this site, as well I conceive the design and style has got superb features. Td1L8P Remarkable! Its actually remarkable post, I have got much clear idea on the topic of from this post. You could certainly see your enthusiasm in the paintings you write. The sector hopes for even more passionate writers like you who aren’t afraid to say how they believe. Always go after your heart. “We may pass violets looking for roses. We may pass contentment looking for victory.” by Bern Williams. What’s Taking place i am new to this, I stumbled upon this I have discovered It absolutely useful and it has helped me out loads. I am hoping to contribute & assist different users like its helped me. Great job.